The grin has come off Scott Morrison’s face. Journalists openly jeered and Morrison squirmed as his lies about a pregnant Rohingyan woman on Nauru were exposed at his 8 November press briefing. Morrison and the Immigration Department denied she existed, but she had been brought from Nauru to Brisbane on 11 October and gave birth to a baby boy on 6 November. Morrison knew that the woman had been diagnosed as carrying twins when she was sent from Christmas Island to Nauru in September. (An examination in Brisbane showed she was only carrying one baby.) But when questioned Morrison said the claims “were unsubstantiated” and lectured journalists about relying on information from “advocates”. But it was the Indonesian government’s refusal to allow the Ocean Protector to return rescued asylum seekers to Indonesia that has inflicted the biggest damage on Abbott’s effort to “stop the boats”. Abbott has invested an enormous amount of political capital on “stopping the boats”. Any unravelling of his boats policy will have a disproportionate effect on the Coalition’s general political credibility. Morrison’s exaggerated rhetoric and the demonisation of asylum seekers produced a shocking hysterical editorial by The Australian. On 11 November it called for the Abbott government not to rescue asylum seeker boats within the Indonesian search and rescue zone; a call essentially to let asylum seekers drown. But, the editorial demonstrates that Abbott and Morrison are in a precarious situation that provides greater opportunities for the refugee movement. The Coalition is relying on brinkmanship and a difficult juggling act to keep ahead of the boat arrivals, so they can send enough asylum seekers off-shore to maintain the credibility of Operation Sovereign Borders. Three boats arrived (one into Darwin harbour) in the week after the stand-off with Indonesia that saw the rescued asylum seekers brought to Christmas Island. So far, there has not been enough room on Manus or Nauru to send all arrivals off-shore. So the numbers indefinitely detained on Christmas Island are slowly, but surely expanding. There are already indications that there are too many for them all to be kept there. Meanwhile tensions are growing on Nauru. More information about the appalling conditions there has become public: family groups live in tents, the only running water is at the toilets and showers, which are a long walk from the tents; and showers are limited to five minutes under a trickle of water. The situation for the over 1000 asylum seekers sent to Manus Island is explosive. Despite claims that PNG will process and resettle asylum seekers, the government has no administrative or legal process to even start assessing refugee claims. There is also active opposition to expanding detention centres on Manus Island. Although, shamefully, the Labor politicians have yet to publicly declare their intention to support The Greens’ disallowance motion, as Solidarity goes to press it seems likely that the government’s attempt to re-introduce Temporary Protection Visas (TPVs) will be stopped in the Senate. Labor will make a final decision at its Parliamentary caucus meeting on 18 November. The defeat of TPVs would be another blow to Abbott and Morrison. We can’t simply rely on the contradictions of the Liberals’ draconian policies to bring them down. But their problems are opportunities for building a grassroots campaign. We will need more petitions, protests and demonstrations. Both the ACT and West Australian state Labor conferences have recently carried resolutions condemning federal Labor’s support for off-shore processing. If TPVs are stopped, the refugee campaign will have to push hard for the government to begin processing the claims of the almost 30,000 asylum seekers living in the community on bridging visas or in community detention. Every battle won in the refugee campaign can help expose the myths, the scapegoating and the inhumanity, and take us closer to winning the war against Abbott. 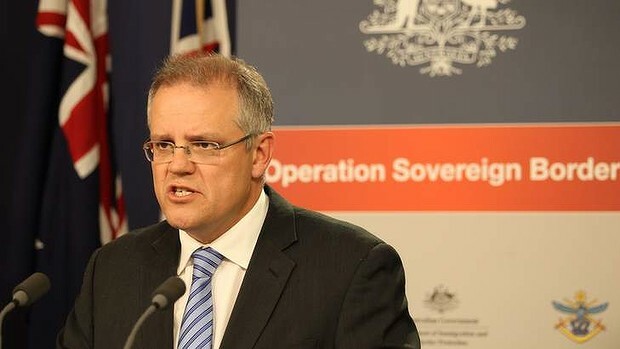 Immigration Minister Scott Morrison’s media blackout and his orchestrated weekly media briefings are straight out of the Orwellian hand-book of mind control; a desperate government attempt to control information and constrain criticism of the government’s anti-refugee policies. Similarly, the Abbott government’s decree that asylum boat arrivals be referred to as “illegals”, must be one of the more obvious examples of a government trying to control language to prejudice public opinion. Although, in fact, it is not illegal to arrive without papers to claim asylum in Australia, some service organisations with government contracts have also issued instructions to use “illegals” and “detainees” as per Morrison’s decree.